I'll admit I'm a Pintrest junkie. I love all of the recycled stuff I see on there! 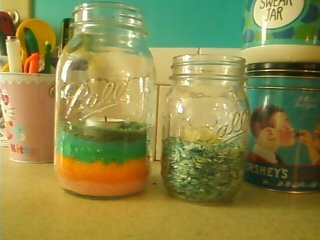 So when I saw all the posts on mason jars, I was all, OOOO I GOTTA TRY! Well I tried, and failed at some of them but I did manage to come up with something I liked AND the girls thought was pretty. 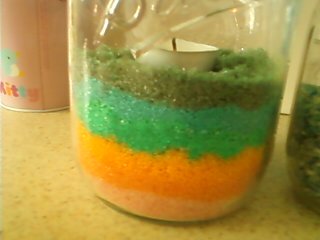 I did this one mixing food coloring with Sea Salt. Picture doesnt really do it justice but its rainbow colors are pretty. 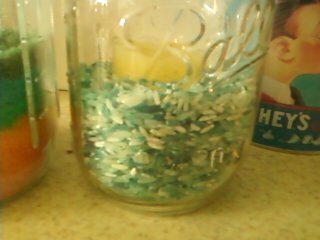 This is made with rice that I colored with blue food coloring. I wanted it to have a varied look and I think it came out nice. Blue is my favorite color!